For car aficionados and collectors or individuals with a keen interest in design, the garage is a place that goes beyond simple storage and protection. It’s a refuge. It’s also a place of distinction. That’s why Nuvo Garage offers the finest quality cabinets available for our garage transformations and renovations. And to satisfy all tastes and budgets, we carry the high-quality systems made by Hercke, Onex and CTECH. Over the past few months I’ve outlined the various features of the very adaptable family-owned, lockable Hercke storage system and multi-colour, options of the Onex line. But for pure, sleek, high tech design, my favourite choice is CTECH. The light-weight high-quality aluminum system was launched in 1995 by professional drag racer, Jim Greenheck, as an extension of his racecar trailer systems. 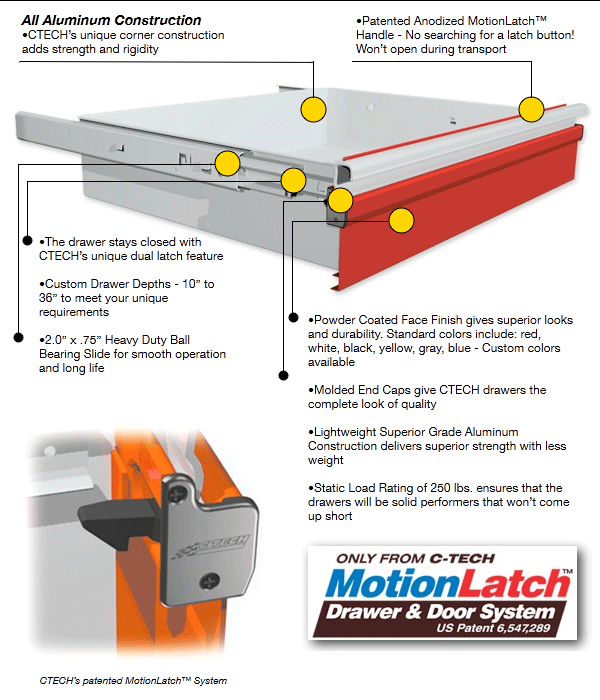 As a result, CTECH has some very cool, space age features like the patented MotionLatch™ drawer and door systems that open with the wave of a hand and automatically latch when shut. The system also comes with a standard leak resistant GasketLoc™ countertop that allows for expansion and contraction without warping. Counters are also injection molded with no sharp edges for a clean, safe finish. These innovations, enduring durability and high style make CTECH the chosen system of motorsport and racing teams as well as connoisseurs of industrial design. 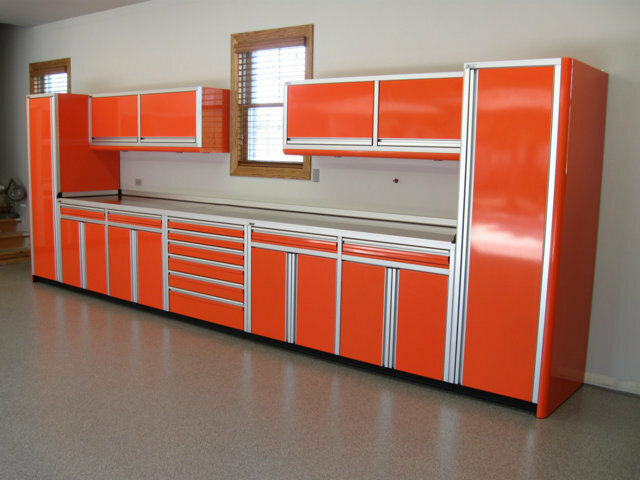 One of the best things about CTECH designs, and the reason why Nuvo Garage offers it to clients, is that these features, which were originally engineered for pit carts, racing facilities and trailer cabinets, translate beautifully to create one-of-a-kind garages. The aluminum cabinets are powder coated and available in nine standard colours – red, yellow, green, blue, orange, midnight blue – as well as white, grey, and black, with custom colours available upon request. This means they can be coordinated with your interior house designs offering continuity between the garage and the mudroom or adjacent laundry room. CTECH cabinet systems are totally customizable to suit your needs and space requirements while also being available in an array of standard configurations. Doors can be adapted to open in either direction and overhead cabinet doors swing open vertically for easy access. So whether you have high performance cars that deserve a home with the same level of sleek engineering, fantasize about owning the track like Paul Tracy or simply want to invest in the best-looking, highest quality storage systems on the market, CTECH can make your racecar and design dreams a reality every time you step into your ideal garage. If you’re interested in a garage renovation, I’d be happy to visit and discuss various design ideas and give you an estimate. Customized CTECH cabinet orders require about six weeks lead time and once they’ve been delivered, our Nuvo Garage renovation can be completed in as few as two days.